How to Solve Your Maths Problems Easily? 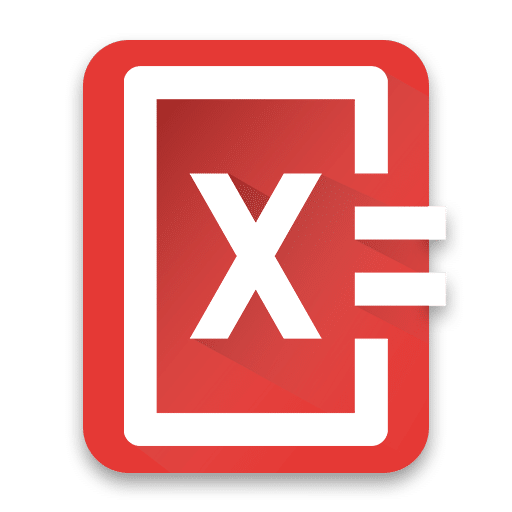 How PhotoMath Works as Free Maths Equation Solver App? Solving Maths Problem is annoying. There is hardly any student who loves to solve maths problems. The reason is that Mathematics is supposed to be most dreadful subject in our course. But anyways, you have to solve your maths problems to complete your homework. So how do you do it? Is there someone who help you complete your maths homework? You must be taking your friends’ help or asking your parents to help you. But there is no need to ask for help from anyone as we have got a free maths equation solving app for you that you can use on your Android, iOS or Windows OS devices for solving maths problems efficiently. So do you hate Mathematics? 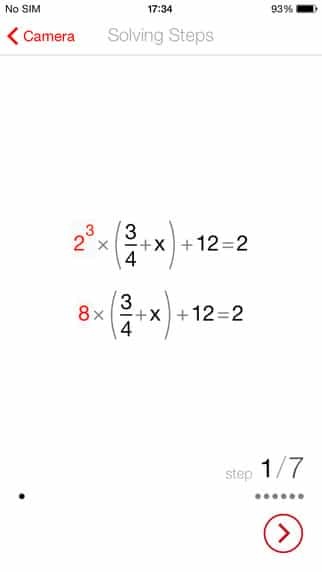 Are you afraid of annoying Algebra equations? If your answer is yes, then you have indeed reached right place as today I’m going to help you know “How to Solve Your Maths Problems Easily?“. Maths is one of the best logical subjects, but some students feel embarrassing while solving maths problems. Usually, they ask their friends, family or teachers to help them solve their maths equations. Some of them are also habitual of using a calculator for solving common mathematics problems. Thus, calculator becomes a necessity for many. Your dependency upon calculator affects your memory and visualization ability adversely. But you don’t primarily need to worry, and it’s time to kick off your calculators. Because MicroBlink [A very powerful app developing company] has brought an idea that makes you fall in love with Maths and mathematical problems of algebraic expressions. Yes, the idea is that you can use your smartphone camera for solving Maths problems now, just by scanning the problem. All that you need is a free maths equation solver app for that. And the name of the App is PhotoMath. PhotoMath is a very powerful app developed for maths hating students and all others who have problems in solving Mathematics expressions. PhotoMath is a free maths equation solver app that help you solve you maths problems. The app comes with nice appearance and user friendly navigation. 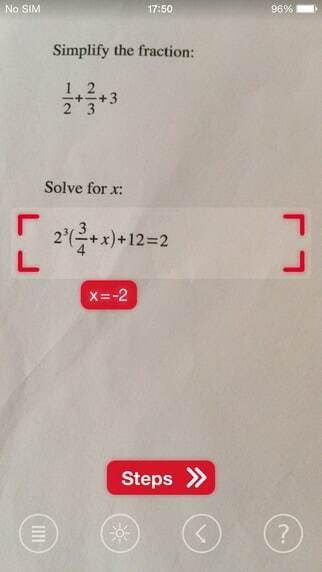 PhotoMath gives instant results after scanning any printed problems of Mathematics. This means, you don’t have to waste time in input-ing raw data in traditional maths problem solvers like calculator and all. In order to get solution of your problems, you just have to scan it and the app will provide you the answers instantly. PhotoMath is a very useful app that helps you in solving your maths problems. The app comes with many powerful features with almost a free tag that makes it an outstanding free maths problem solver app. 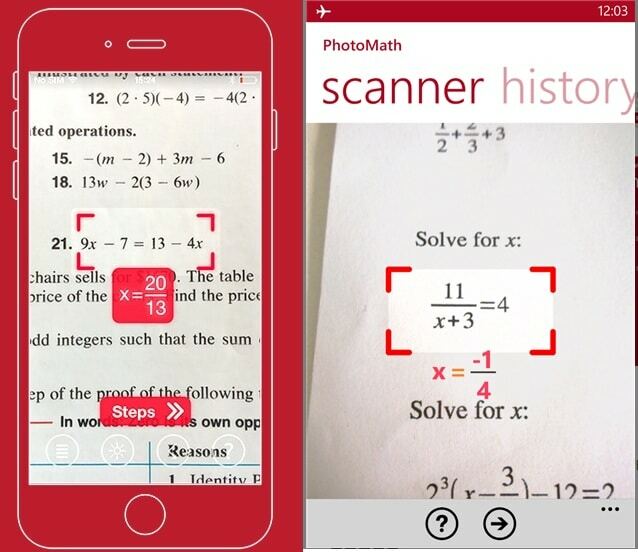 PhotoMath scans and reads your printed mathematical problems with the use of the camera of your mobile device. 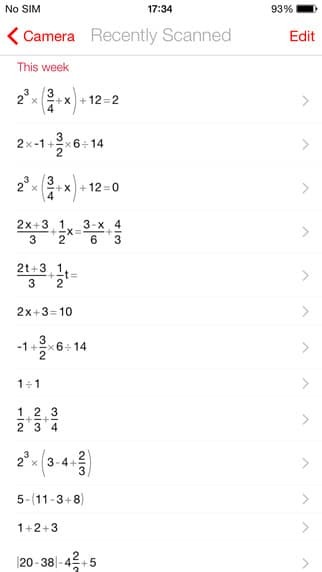 Then, provides you the instant results of you maths problems. Thus, it makes Maths easy by providing solution to the users instantly within a fraction of second. The app will provide you step by step solution as your teachers teach you. So just scan the problem and learn how to solve that equation step by step. PhotoMath allows you to see the solution of maths problems that you scanned in the past also as it keeps a history of all such scanned problems. You can easily navigate to scanned history and see those step by step solution once again. Yes PhotoMath is very efficient with less or minimum working. What does it mean ? It means PhotoMath is too handy and easier to use. You don’t even have to click your capture button to take images, you have to only put your phones camera on the problem and let PhotoMath do all works for you quickly and easily. Arithmetic expressions, Fractions and decimals, Powers and roots, Simple linear equation, Quadratic equations, Inequalities, Simple equations systems Absolute value inequalities, Absolute value equations etc. But what is worth noting here is that it is constantly adding new features. Hence, it is not a bad idea to try PhotoMath for solving your maths problems from now onwards. So are you ready to use this free maths problem solver app ? PhotoMath is not only best android app for maths but also for iOS, Windows, Amazon etc as you can easily use this without any problem. Here are the various links for downloading PhotoMath – Android, iOS, Amazon, Windows, Official Page. Now, that you have got the best equation solver app for free, let’s see how it works and how you can use it for solving your own maths problems. The PhotoMath app has a red frame like scanning point that scans your printed equations after bringing the problem in that red frame. PhotoMath has Optical Character Recognition technology that helps to read problems and calculating answers for you. But one disadvantage is that PhotoMath app can’t scan your questions that is written by you. It can only scans printed problems. Watch this video for better understanding. PhotoMath is a very powerful app which can also be considered as world’s first and smartest camera calculator which has certainly got much smarter than all the traditional calculators in existence right now. It may replace the traditional calculators in upcoming years, but what is most interesting is that – the innovative idea of showing step by step solving of maths problems or equations. So, use this free maths equation solver app for solving your maths problems easily and quickly and start loving mathematics. Do you know any other such free maths problem solver app ? Share your views and experience with us using the comment box below.